Governance and Ministry has proven to be an indispensable guide for leaders and clergy on how to work together to lead congregations. In this second edition, veteran congregational consultant and minister Dan Hotchkiss updates the book to reflect today’s church and synagogue landscape and shares practical insights based on his work with readers of the first edition. Governance and Ministry highlights the importance of reaching the right governance model for a congregation to fulfill its mission—to achieve both the outward results and the inward quality of life to which it is called. 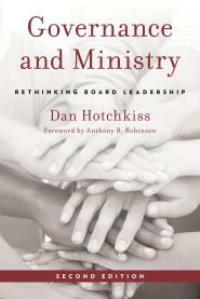 Hotchkiss draws on governance research from business, non-profits, and churches, as well as deep experience in a variety of denominations and congregations to help readers determine the governance model that best fits their needs. The second edition has been streamlined and reorganized to better help readers think through leadership models and the process of change. The book features new material on the implications of congregation size, the process of governance change, policy choices, and the lay-clergy relationship. It also features two appendices with resources often requested by Hotchkiss’s consulting clients: a style guide for policy-makers and a unified example of a board policy book.